Welcome to Bremen! We are happy to have you. This programme is your guide for the orientation days into studying digital media. 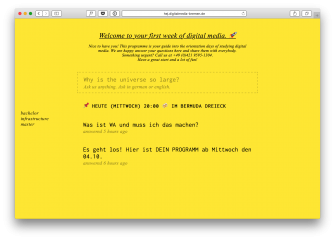 Visit dm-hb.de/hej once in a while to stay up to date and find all the information you need. Looking forward to meet you. Have a great start and lots of fun!